Ask any welder, the best welding gloves offer flexibility, durability, comfort and heat resistance. Even though the sole purpose of a welding glove is to protect your hands from high temperatures, they are not all the same. Grain, Split, Deerskin, Pigskin, Cowhide, Mig, Tig, Stick gloves, oh the pressure! There’s a few things to consider when shopping for welding gloves. First the protection level, application, leather preference and quality(which often follows price). Grain: The smooth outer layer from which the animal hair grows. Grain leather appears smooth and shiny and provides better sensitivity and control. Split: Located entirely on the flesh side. Split leather is napped (also know as suede) and is much thicker. Tig Welding: TIG welders use one hand to add the filler rod while the other hand holds the torch. This type of welding produces the most heat which requires thicker gloves. The most important feature in a TIG welding glove is Kevlar thread that provides additional heat resistance. In addition, a TIG glove lined with wool or cotton-foam can provide more protection than a glove lined with cotton. TIG Welding Gloves are designed specifically for TIG welding. They offer the maximum heat protection features without loss of dexterity. 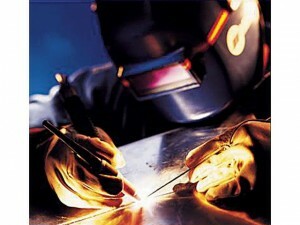 Mig Welding: Mig Welding is the most common used welding process. It uses a welding gun, a power source, shielding gas and a constant feed of welding wire. This process generates high heat and requires high dexterity. MIG Gloves feature excellent heat protection along with comfort and dexterity. STICK (SMAW) Welding: Stick welding (also referred as arc welding) is a manual welding process that uses a consumable electrode coated in flux to lay the weld. This welding process produces less heat with virtually no sparks or splatter. STICK welding gloves provide low heat protection and emphasize on dexterity. Thin, top-grain pigskin, deerskin gloves are often used for Stick welding.